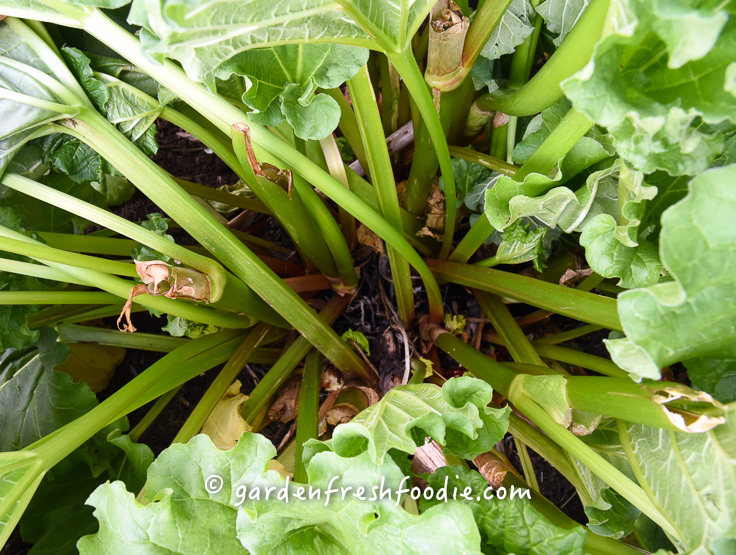 Rhubarb packed into your CSA farm share? Have no idea what to do with it? Well here I am to save the day! In fact, this recipe was created for a class I’m teaching this week entitled, Cook the Share! Rhubarb is quite versatile and helps to thicken sauces, lending it a perfect accompaniment to sweet in-season fruits. This time of year, that’s strawberries! Rhubarb is quite sour, and often is found in recipes loaded with sugar. There’s no need to overdo the sugar if you start with naturally sweet fruits. Berries are great to balance the sour flavor of the rhubarb. In this recipe, I add in some sweetened ginger, to provide a zing and some sweetness to offset its sourness, but feel free to use fresh, raw ginger in its place to cut down on sugar. I purchase this crystallized organic ginger from Amazon. 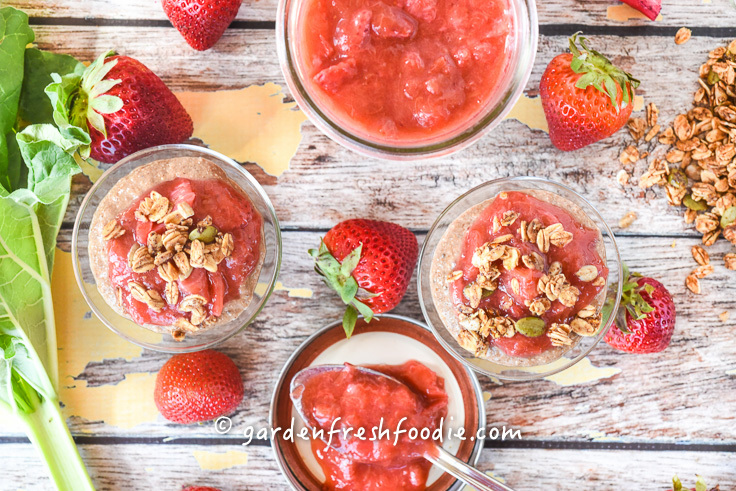 This strawberry rhubarb compote is even better the next day! It’s perfect for topping on my Cinnamon Chia Seed Pudding topped with my Tahini Ginger Granola (all 3 of which can be made ahead of time), or as a topping for waffles or oatmeal! It would also make a fast and easy jam, simply add less water if this is what you’re after. 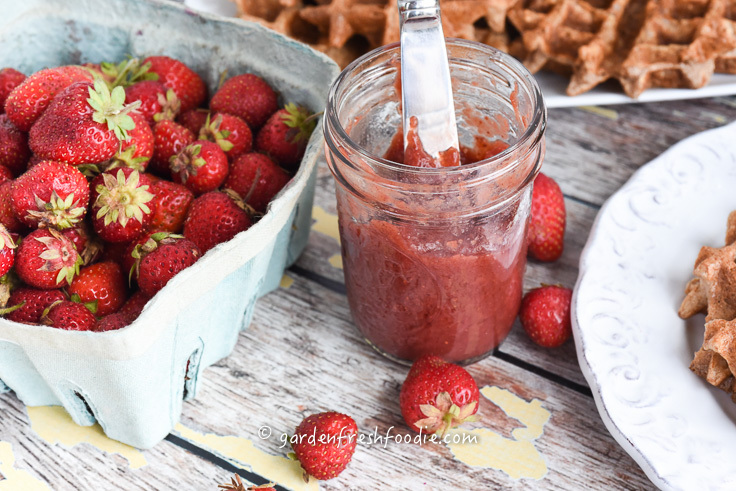 If you’re looking for a traditional strawberry jam, here’ my strawberry lemon jam. Rhubarb is a traditional plant in the cottage garden and grows as a perennial (it comes back every year). It’s a large, showy plant that provides season after season, and is BEYOND easy to grow!! There are different varieties, some more red than others, but they all taste roughly the same. My variety, sadly isn’t as red as I’d like it, but when combined with a red fruit like strawberries or cherries, it will take on the color of the other berries. To harvest it, you simply tear off the stem of the plant at its base. It’s season is best from May-early July, but can be harvested all summer. Be sure that you DON’T EAT THE LEAVES: while they look beautiful and just like swiss chard, they are very high in oxalic acid and can cause extreme sickness. Eat only the stalks, and enjoy. Save the leaves for your enemies (I’m just kidding, I hope you don’t have any enemies!). 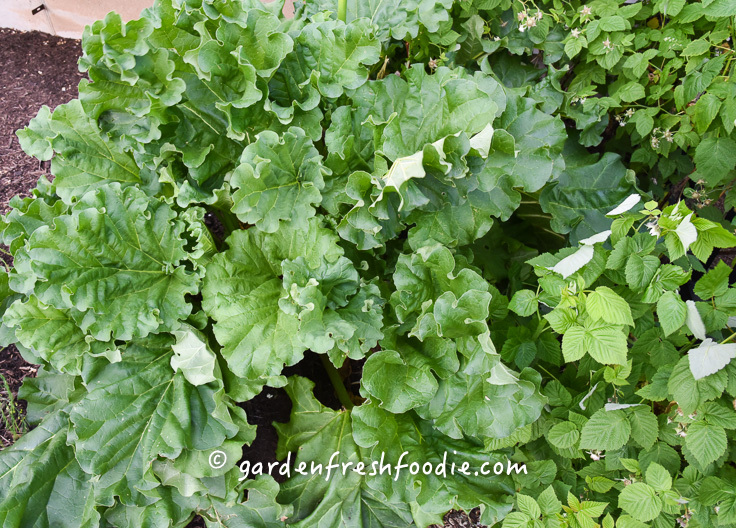 If you have an animal that would be prone to eating leaves, rhubarb might not be a great plant for you to grow. 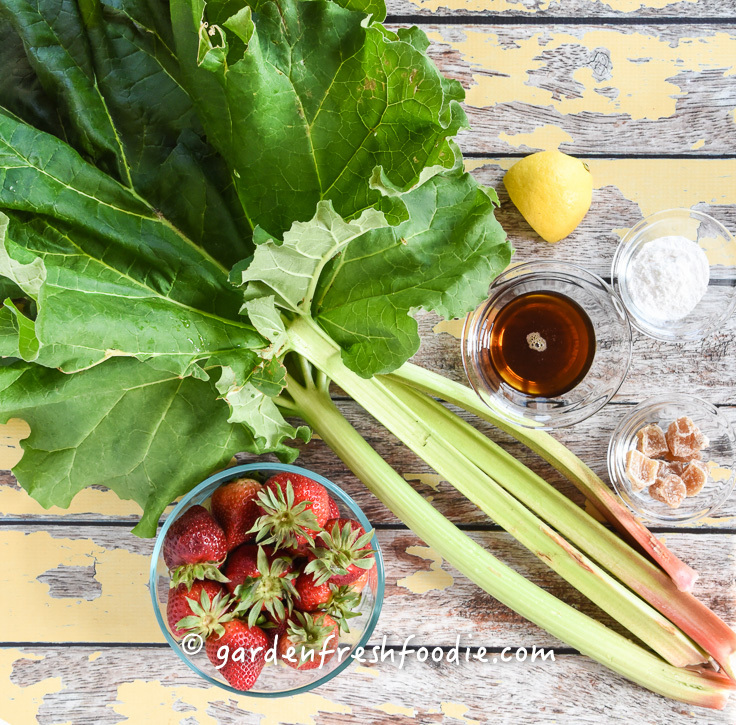 Rhubarb can be a little stringy (due to its high fiber content). Often when I cut it, the outer layer will peel slightly. Peel this off and remove it in other areas as it happens. If you love rhubarb, you can freeze it also. Just wash and slice as you would for cobblers or muffins, place on a cookie sheet and freeze for 2 hours. Remove from the freezer and place into freezer bags or, better yet, a vacuum sealed bag. We love our vacuum sealer. It’s great for so many things, and really keeps your food better sealed. This way, you can make rhubarb pies, tarts, and chutneys all year long! Rhubarb has some great health benefits. It’s a good source of fiber, protein, vitamin C, vitamin K, B complex vitamins, calcium (as much as a glass of milk in 1 serving! ), potassium, manganese, and magnesium, while being very low in calories. In terms of organic compounds, rhubarb is a rich source of polyphenolic flavonoids like beta-carotene, lutein, and zeaxanthin. It does contain oxalic acid (highest levels in leaves, which is why you shouldn’t eat them). Because of this, those who suffer from kidney issues and gout, should avoid eating rhubarb. In general, the best time to harvest rhubarb is spring-early summer, and then again when the temps cool in the fall. The plant can get kind of lanky, and stringy when it’s too hot outside, however you can still harvest. Rhubarb can be frozen, and used in recipes throughout the year. It makes a great filler and companion with any berry. You can also create a chutney with it, and make it savory, adding onions, vinegar, and other fruits like pears or apples to it. This would be great on a veggie burger like my Real Deal Veggie Burger. 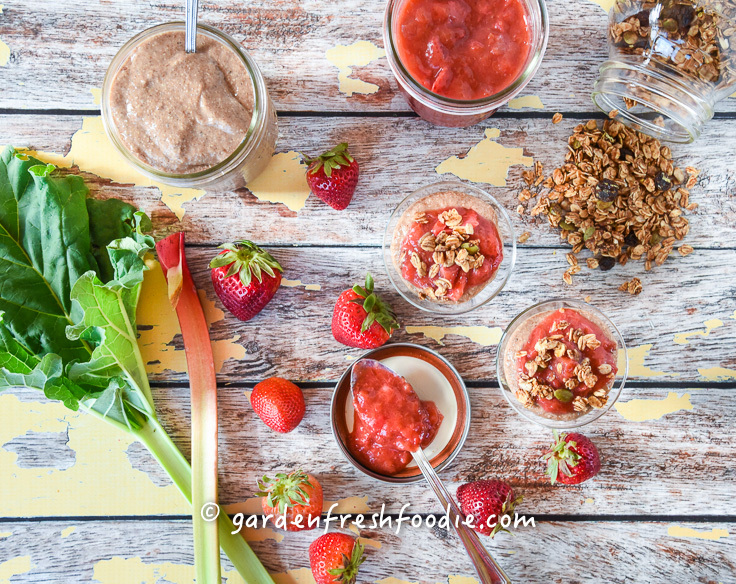 Chop strawberries and rhubarb. Sometimes rhubarb can be stringy. If this happens as you cut it, remove the strands. Serve atop waffles, chia pudding topped with Tahini Ginger Granola, or use as a jam. Sauce gets even better the next day! Rhubarb: good source of fiber, protein, vitamin C, vitamin K, B complex vitamins, calcium (as much as a glass of milk in 1 serving! ), potassium (very high), manganese, and magnesium, while being very low in calories, rich source of polyphenolic flavonoids like beta-carotene, lutein, and zeaxanthin. It does contain oxalic acid (highest levels in leaves, which is why you shouldn’t eat them). Because of this, those who suffer from kidney issues and gout, should avoid eating rhubarb. 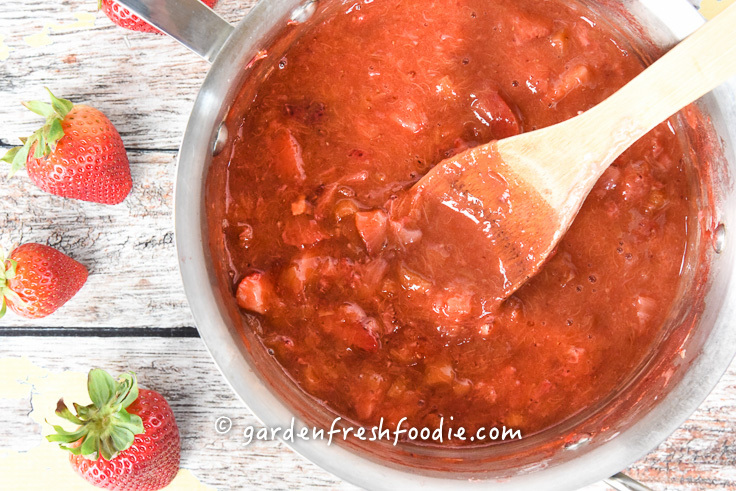 Strawberry Rhubarb Compote-A great way to utilize in-season rhubarb and strawberries! 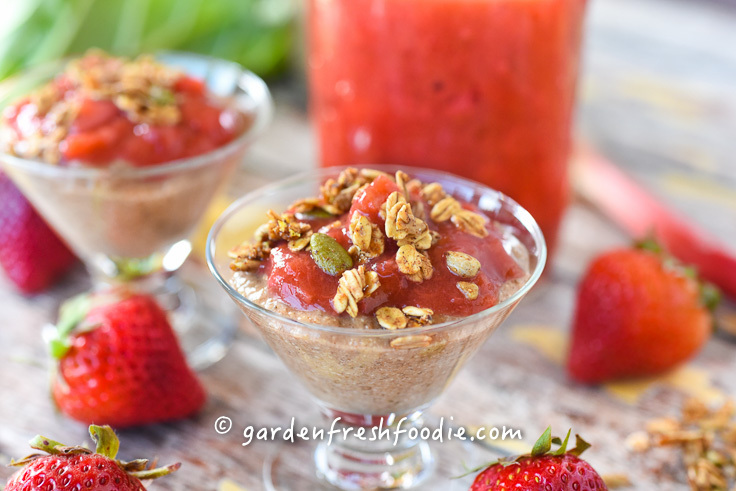 With ginger to spice this up, this compote is great atop oatmeal, waffles, or chia seed pudding!